Enter your mobile phone number below to receive your $5 coupon. Invalid phone number provided, please try again. Invalid email address provided, please try again. Please check opt-in box to text alerts. **You will receive up to 10 text messages per month sent by or on behalf of The Home Depot via automated technology to the mobile phone number provided above. Consent is not a condition of purchase. Message & data rates may apply. Not all carriers covered. You can always text STOP to 38688 to opt-out (you will be sent a confirmation message), or call 1-800-553-3199. Text HELP to 38688 for help. I understand that checking this box constitutes my signature. I further understand that my information will be used as described here and in The Home Depot's Privacy and Security Statement. 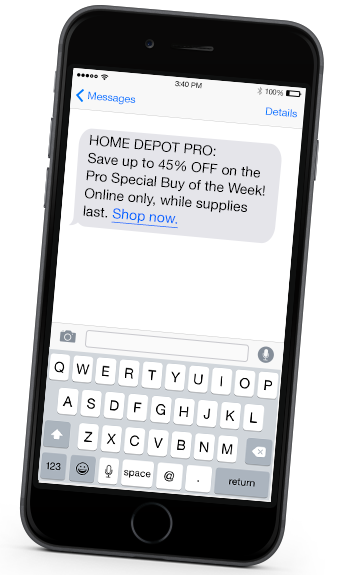 The PRO Text Program is one of several text alert programs that The Home Depot may conduct from time to time. Your signed consent to participate in this program will be treated separately from your consent to participate in any of our other programs. You will be given information about how to opt into (and out of) those programs at the time that you sign up for them. Value is invalid. Please try again.